In recent weeks, our Cyber Intelligence team has identified Muslim hacktivist group intentions to launch a cyber operation against Israel on April 7, 2014 – one year after the last April 7 campaign that attempted to shut-down Israeli cyber space. AnonGhost Team was the first to announce on December 23, 2013 that it would launch cyberattacks against Israel on April 5-7, 2014. 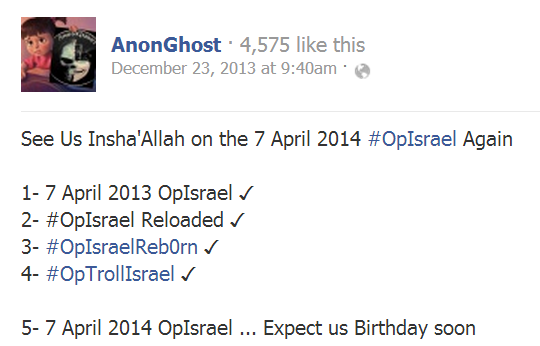 The group, that initiated the previous April 7 campaign, also published a video entitled “#OpIsrael Birthday” (likely intended as a warning that this campaign will launch annually on April 7). Shortly after the AnonGhost announcement, other groups, such as AnonGhost Tunisie (sic.) and the Norwegian Ghost Cyber Attackers opened event-pages on anti-Israel Facebook. In addition, several other groups, such as the pro-Palestinian Fallaga and Virus Noir Ps, were listed as participants for future cyber operations. The main targets are mostly government websites, but we assume that more targets, largely financial, will be advised soon.